It’s been pretty warm out these past few days, at least I think so. Paislee, on the other hand, said that it’s been warm all winter so far. Where she’s from it gets a lot colder so for her 18° is warm! For the rest of us 18° is cold. When I first came to the school I though 45° was freezing but I’ve gotten used to the cold. Since it’s been so warm out lately, at least for Paislee, she’s been wearing mostly spring/summer clothes. 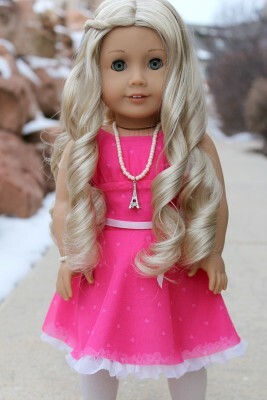 Today she wore this pink dress with hearts, tulle ruffles, and a white ribbon belt around the waist from American Girl. This dress is perfect for valentines. She also wore a white beaded necklace and bracelet. The necklace has an eiffel tower charm. I actually made the jewelry the other day because I noticed we didn’t have much. I think they look really cute! What do you think? Elegant Mint Copyright © 2019.